The stunning photos (in the slideshow at left) show the property across from Rock Creek Ranch that SRA has an opportunity to purchase from the McClendon Trust. The land includes a high river terrace, beautiful beaches and a beautiful sweeping bend of the Smith River spanning a distance of approximately one-half mile. SRA is working hard to find the final $10,000 needed to complete this important project. SRA has raised $15,000 in 2011, including a recent $10,000 grant from the MiaBo Foundation toward the $25,000 private “match” for the project. The private match is a requirement of the California River Parkway Program which has awarded a $389,000 grant for the project. Purchase of this property will permanently protect critical habitats within the river corridor. It also presents the opportunity to maintain the wilderness like views from every vantage point at Rock Creek Ranch and surrounding lands. SRA will manage the land consistent with the State and Federal Wild and Scenic designation of the South Fork Smith River as undeveloped wild habitat. A key feature of this land is that it is accessible via the river. Most of the land cannot be reached by road, which enhances the wilderness experience for all visitors. River travelers may stop at the sandy beaches to lunch or overnight camp on the flat river terrace above the banks. This stretch of river presents fabulous outdoor opportunities for birdwatchers, plant lovers and whitewater seekers with everything from a Class III rapid, to calm deep pools and rock wall gardens on the river bank supported by water seeps. Rock Creek Ranch may access the property by fording the river or canoeing across, while hikers may connect to the property and access the river via the Coast to Crest Trail. The full range of terrestrial and aquatic species associated with the forest, riparian and aquatic communities will benefit from this purchase because these habitats will be permanently protected. Plant communities on the 100 acres include Red Alder Riparian Forest, Tan Oak Forest and Upland Douglas Fir Forest which in turn support Northern Spotted Owl, Pacific Fisher, Humboldt Marten and Bald Eagles. Aquatic habitats of the Smith River support Coho and Chinook salmon, steelhead, coastal cutthroat trout and countless aquatic invertebrates. The 14th annual Coho Confab is sponsored by Trees Foundation, Salmonid Restoration Federation, California Department of Fish and Game and Smith River Alliance and takes place from August 19-21, 2011 at Rock Creek Ranch on the South Fork of the Smith River. Don’t let the name fool you. There is more to this weekend symposium than just coho. The Confab is a venue to explore watershed restoration and to learn and share techniques to enhance recovery of salmon and steelhead. It is also an opportunity to connect with community members, watershed scientists, resource managers, and activists from around the region and California. Sessions at this year’s confab will include a number of hands on learning experiences like instream fish identification plus restoration project tours, along with great talks by the experts. The event launches Friday evening with an after dinner talk by Troy Fletcher, a policy analyst with the Yurok Tribe, on restoring coho salmon habitat in the Klamath region. On Saturday concurrent workshops and tours will take place. Participants will choose from either a full day tour of Mill Creek restoration projects or feature workshops on fish passage projects, aquatic insects, and wood loading to restore stream function and habitats. Saturday evening’s open forums will be led by stories and songs of salmon with Walt Lara, Tribal Elder of the Yurok Tribe and Joanne Rand, singer and songwriter. We’ll also hear about the impact of pesticides on Salmonids before our BBQ dinner. After dinner, local talent and more music from Joanne Rand will carry us into the night. Sunday’s itinerary ends in the early afternoon and once again choices must be made as to which of three workshops to attend. It will be a tough choice as they are all sure to be interesting and informative. This event is a great opportunity for networking and sharing our own learning experiences with others. Hopefully we can all take home something new to our own projects and places. There is still time to sign up for the Confab. 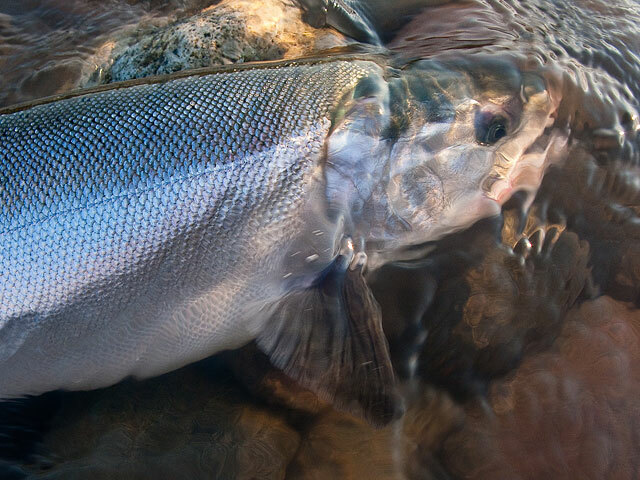 Visit the Salmonid Restoration Federation website for more information and a complete schedule. What could make a stay at Rock Creek Ranch (RCR) even more fabulous? How about a hot shower at the end of the day? 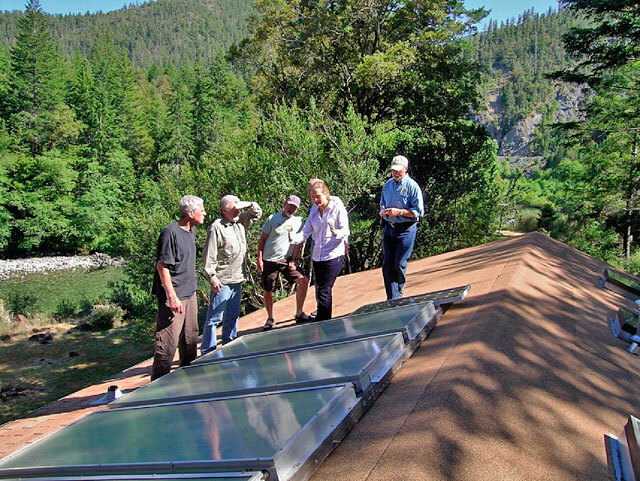 Throughout the spring, Super Board Member Juliette Bohn, has led a team of students from Humboldt State University Renewable Energy Student Union (RESU) to plan, design and install solar thermal showers at Rock Creek Ranch. Ben Scurfield of Scurfield Solar has also been supporting the team. The RESU team decided on a closed loop, drain-back system that uses water as the working fluid. “Closed loop” refers to separating the water heating loop from the shower water. This will help to maintain the quality of the water used for showering. The “drain-back” component consists of a small, 10 gallon tank that holds the water from the panels when the system is not in use (i.e. night time or winter time). This part of the design was chosen to provide freeze protection with minimal ongoing maintenance. Currently, the solar thermal panels are in place. The plan is to complete the installation of the showers as funds are raised. Showers will be primarily used during the summer months (May through September) and should serve 20 people, depending on the weather. This system will complement the SRA goal of making the Rock Creek Ranch facility self-sustaining, as well as a renewable energy education center. SRA is grateful for the donations of solar thermal panels and equipment made by Zack and Jennifer Larson — and for the leadership of Juliette Bohn and Ben Scurfield. Additional support for the project has been provided through a $3,000 grant by the Caldwell & Sund Family Trust. Kevin and Donna Sund-Caldwell are local physicians who are thrilled to help SRA complete this important project. They have pledged a second grant of $2,000 if SRA can raise the $3,500 balance required to complete the project by the end of summer. Let’s have those solar showers ready for our August and fall visitors! To contribute please note “solar shower” on your check. 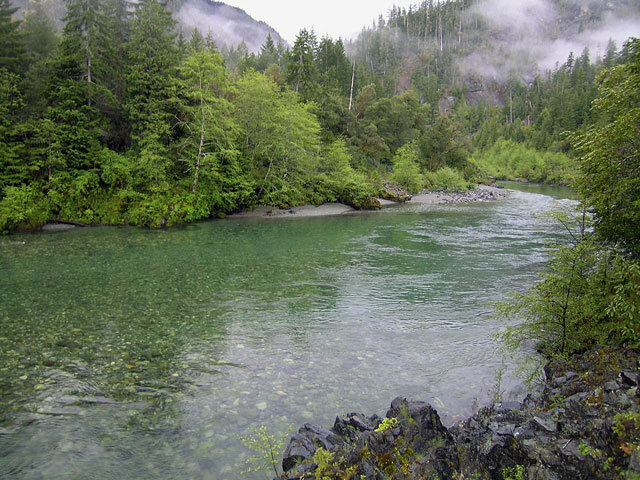 The 2011 Smith River adult fish count is just around the bend. Around 50 people are already signed up to don their masks and snorkels and take the plunge to see who is swimming in our river this summer. Rachel McCain has volunteered to head up the event for the second year in a row and has no plans to stop there. “I hope to be doing this as long as I can,” she told Smith River Alliance, and we are grateful to have her help! Rachel pointed out that although salmon are elusive during the summer survey, fish counters should expect to see plenty of cutthroat trout and a good dose of rainbow trout. The numbers of cutthroat and rainbow trout recorded during these fish counts have held relatively steady over the past ten years. That’s good news for us and good news for the fish. This year’s event will be based at the lovely Rock Creek Ranch July 29-31. 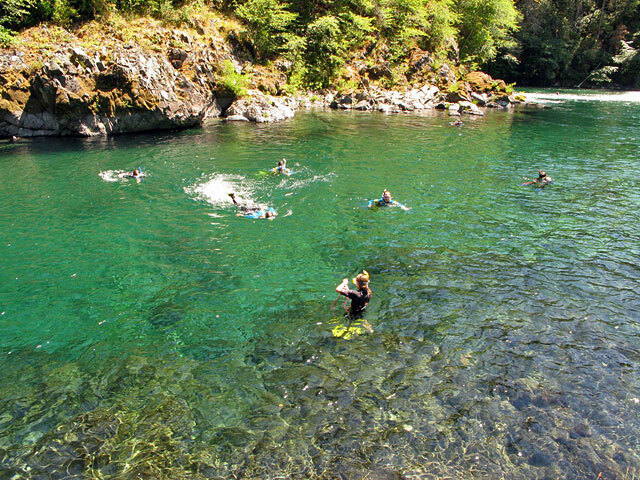 Participants can look forward to experiencing firsthand what a fish’s life is like in the Smith River. Along with enjoying the river, participants may join in the community/pot luck dinners and camping at Rock Creek Ranch in the company of friends. If you’ve done it before — come back and do it again. We appreciate having experienced folks to help train our new counters and keep our data collection consistent. If you are new and willing to give it a try, join us and be trained on how to identify and count fish. SRA is pleased to announce two new River Guardians. These businesses support our watershed protection and restoration work — and we ask you to please give them your business. Wildberries Marketplace is an exceptional supermarket with a wonderful ambiance in Arcata. You guessed it: they have everything! You’ll even find Ramone’s Bakery there. For 40 years Kokatat has been making the best paddling gear in the world. From personal floatation devices to GORE-TEX dry suits that carry a lifetime warranty to splash-tops for casual paddlers — Kokatat has it all. You find Kokatat products in use with the US Coast Guard, Search and Rescue Teams, and of course, on our Smith River trips. Thank you Wildberries Marketplace and Kokatat! Organizational Update: Welcome New Staff Member! Haven Livingston recently moved to Crescent City and joined the staff of SRA after taking many annual trips to the area to kayak the Smith River. She comes to us from Santa Cruz, CA where she had been working at UC Santa Cruz Long Marine Lab researching biodiversity of intertidal algae and invertebrates. Her educational background includes a BA in environmental studies and a MS in water resources management from UC Santa Cruz and University of Wisconsin, Madison respectively. She enjoys travel writing and contributes articles to Adventure Sports Journal. Haven will be working part-time with SRA at least through the Fall on various projects, Rock Creek Ranch events, and social media/outreach. 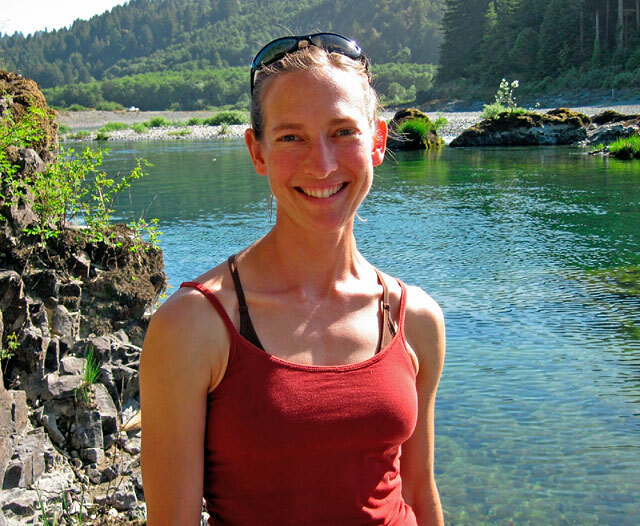 She is excited to put her passion for watershed issues and writing to work for the Smith River Alliance. When she’s not working you might see her out exploring the extensive trail networks, learning to roll a kayak, or taking trips to rock climbing destinations around the west. She’s especially thrilled to have a sweet swimming hole in her own backyard. We are excited to have her join the Smith River team. Welcome Haven!